And welcome to part two of my grandiose three part reviewing epic. In this instalment of the robust Indie Gala V, we take a look at the tier two games. These are the games you get for paying over $4 or more. So if you're interested, just grab a couple of toonies and pony up to help out with the earthquake in Emilia Romagna and help to fund AbleGamers. And don't forget about the eight games I've already covered. But what games do you get on this new tier of your Gala invitation? It certainly covers a variety of genres, including 4X, racing sim, RTS and puzzles. As always, skip past the break for my take on them. One genre I never really expected to see in an indie bundle, much less in an indie bundle with fifteen other games, is a 4X game. In particular, I'm surprised to see a niche one like Space Empires. These sort of games just kind of burrow into nice little niches on the internet, cropping up here and there through word of mouth and "best 4X games" lists. 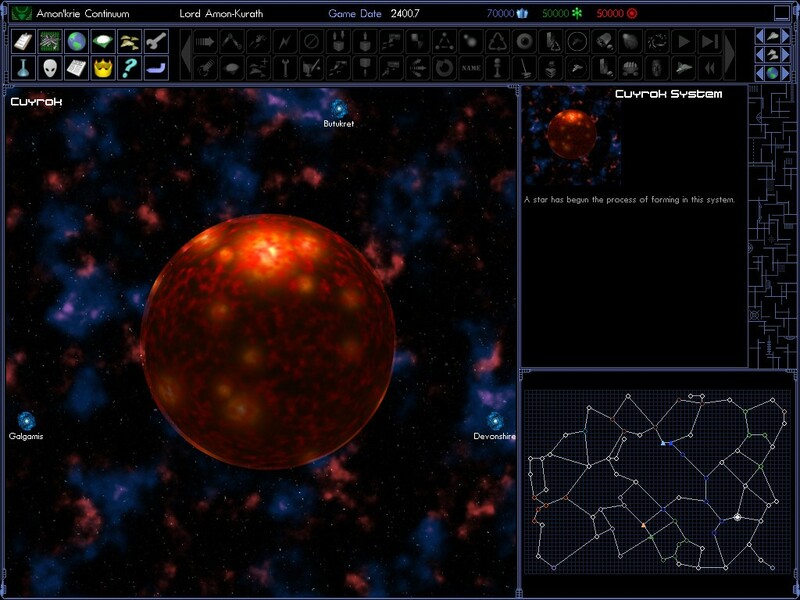 4X games are long, complex time investments, and small ones like Space Empires rarely achieve or strive for anything more than a cult classic appeal. But fortunately for space emperors like myself, here it is in a bundle. If you like games along the lines of Master of Orion, clear your next few days for a round of Space Empires IV. Maybe it doesn't have the same instant classic appeal of MoO, but Space Empires IV is definitely a worthy 4X title for my ever expanding library. Unlike many space 4X games that try to reinvent the 4X wheel alongside the setting, Space Empires closely follows the guidelines laid out by Civilization. Sure, you use spaceships instead of settlers, and the planet layout certainly limits your facilities and resource output, but the game is grid based, resource based, decade spanning combat between you and other players to become the dominant empire. There are a few issues. It's certainly dated in terms of graphics and game design. The user interface is unwieldy and complex, while short-cuts and hotkeys aren't particularly helpful or relevant. Diplomacy isn't well implemented either, and everyone I ran into just attacked and harassed me as soon as I made first contact. It also has a far too verbose tutorial, that explains things like how to press the backspace key to clear a text field, but neglects to discuss little things like, oh, everything combat related. But the good considerably outweighs the bad. 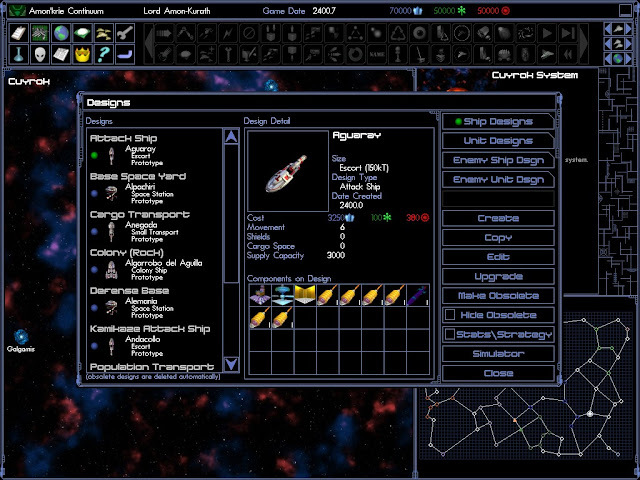 Building your own ship designs is the coolest, and stealing the optimized designs of other races is even cooler. Researching is extremely robust and good at rewarding you with fun upgrades, unlike the many filler technologies in other games. The warp hole based map is fantastic for tactics, letting you construct blockades and find new resources quickly. Colonies are fun to design, as planets are limited in size so you need to construct specialized cities based on their position and resources. Overall, Space Empires hits each of the four Xs just well enough to create a well designed game system that's perfect for those looking for something a little newer than MoO, or for those bored of Gal Civ 2. A pleasant surprise overall. Well, here's the thing about Battle Mages. 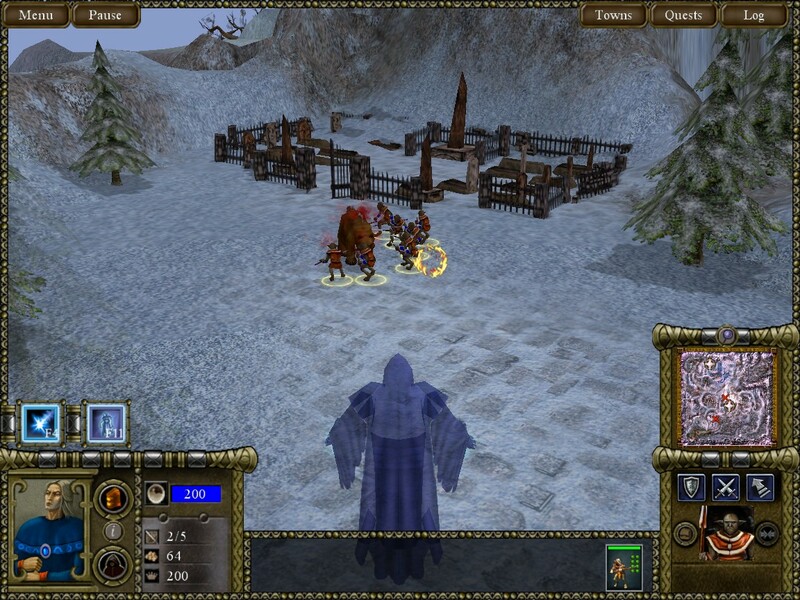 At first I was lukewarm on it, because it looks way too similar to Warcraft 3. The unit designs, the polygon art style, the menus, the UI, the cutscenes, even the colours of the armies. It's all identical to Blizzard's RTS, except, you know, without the Blizzard budget to match it. In all honesty, my cloning alarm bells went off as soon as the game loaded. Then I started to really like it, because it entirely did away with base building and armies, and instead went with an RPG like approach to quests and small squadrons. Doing quests for the towns on each map improved their sizes and resources, allowing you to recruit bigger armies and better units. The fact that you actually have an avatar to control is nice too, as you play as the astral spirit of a Battle Mage, letting you zip over the landscape and interfere in battles with your spells. I get that fundamentally the only difference between this and any other RTS is that there's a big blue mage taking up a sixth of the screen, but for whatever reason it made a huge difference to me. Then I realized that there is a serious issue with this game: the incredibly dumb AI of your units. Right click on an enemy, your squadrons attack, right? 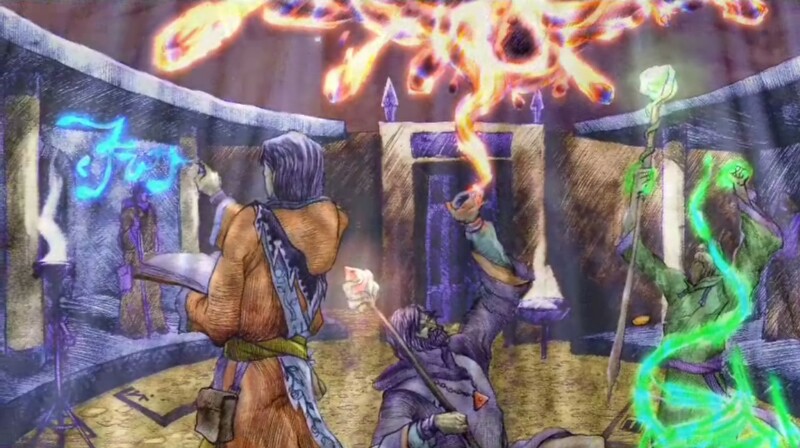 Well, in Battle Mages, three of them might attack while the other nine stand around and pick their noses. This applies to enemies too, so battles in close quarters generally descend into everyone looking around and being rather pleased with themselves while one goblin gets eaten by a bear. The solution is to not fight in close quarters, except the entire first level takes place in a forest. Whoops. Maybe I just got unlucky, but that sole issue alone cost me hundreds of unnecessary gold and units that just politely waited for the angry bear to maul their friend before walking to his spot and doing it all over again. Unresponsive units is one of the most frustrating issues an RTS can have, and even with the smaller scale of Battle Mages it still breaks the balance. So what we're left with is a game that looks kind of like Warcraft 3 and has a few really cool ideas but ultimately capsizes itself with a serious bug. Guess what? Due to being pretty nerdy and not from Europe, I know literally nothing about the FIA or racing games or cars in general, really. It's not that I don't enjoy the occasional foray into the genre, because I do. It's just not a priority over most other genres. Luckily for you, I've learned lots of things about rallies today. Let me share some with you. For one thing, I didn't know official WRC tracks were so picturesque. 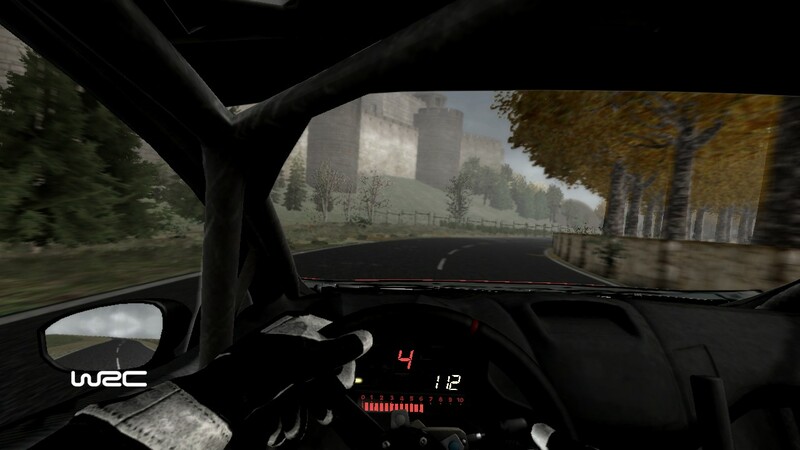 The game contains a mind blowing number of locales all across the world, and each one has three tracks to be raced forwards and backwards. This adds up to a staggering number of unique tracks, and all of them look fantastic. Each country contains plenty of scenery and eye candy, and it's clear the developers put a lot of effort into making the tracks look good and play well. Furthermore, the cars themselves are fabulously detailed. My favourite element is the dirt and dust; sure, most racing games have deformable cars for when you crash spectacularly, but how many have you played that throw up earth and mud all over your shiny ride every time you cruise down a muddy road. It's a tiny element, sure, but it's also a good one. 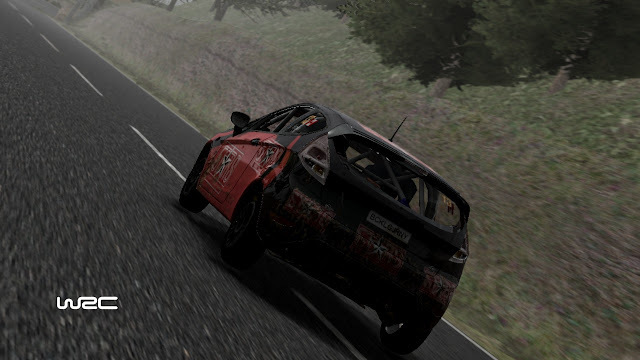 Another thing I didn't know about the WRC is the inclusion of co-drivers. This gets implemented into the game as an early warning system, as your partner exists to warn you about what turns are coming up and comment on your performance. Due to the procedural generation of his or her advice, the sound bytes can be a little stilted, but that's a minor quirk that doesn't detract from the core system. Verbal warnings serve as a great alternative to the usual mini-map. Plus, the game includes three settings to adjust how much assistance the game will give you. At the highest settings, the game purports to be a borderline sim. On the other end of the scale, for dumb folk like me who never let go of the accelerator, the game has a brake assist system that will kick in on particularly tricky turns, handling your handbrake until you regain control. It's a weird feeling at first, but once you get used to it you start to realize when you should be braking, and then you can slowly learn the proper technique in the included learning modes. It's a neat way to teach the game. A third thing I learned about was the fact that WRC rallies don't feature simultaneous racing. For those of you who like the feeling of jockeying with twelve other cars for first place, it's a bit of a disappointment. If time trials are more up your alley, you'll be thrilled. Personally, I can see why they do this with the emphasis on perfecting your own technique, and the game is still plenty fast paced and tense. As I said, I'm not a pro when it comes to racing games. I do appreciate ones that are fun and well designed, and WRC FIA World Rally Championship fits the bill. With good production values, tons of events and the coolest instant replays I've seen in a while, it's an easy recommendation for any racing fan. I was less than pleased with the other Invent4 game in the bundle, the ill designed Razor2. Looking at this game purely on the surface, I had a sinking feeling I would be in a similar situation this time as well. Fortunately for me, the gameplay is actually not so bad at all. Unfortunately, the artwork and humour just rubbed me the wrong way, and it's enough that I don't feel particularly compelled to return to the game when the review is done. 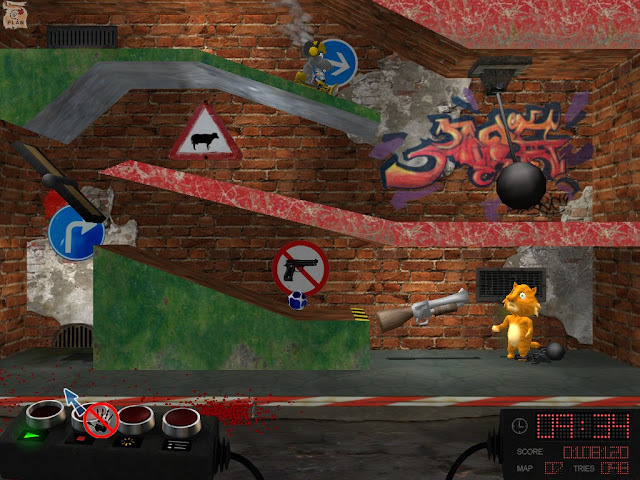 Bad Rats is an entry in the sadly under-appreciated Rube Goldberg machine subgenre of puzzle games, i.e. The Incredible Machine and its later iterations. Using bits of junk and doodads, and also a team of very pissed off rats, you need to construct elaborate mechanisms to murder a cat, usually by knocking something over in the general vicinity of its head. The puzzles are generally moderately clever, while the solutions are fairly open ended and full of short-cuts and changes to be made. 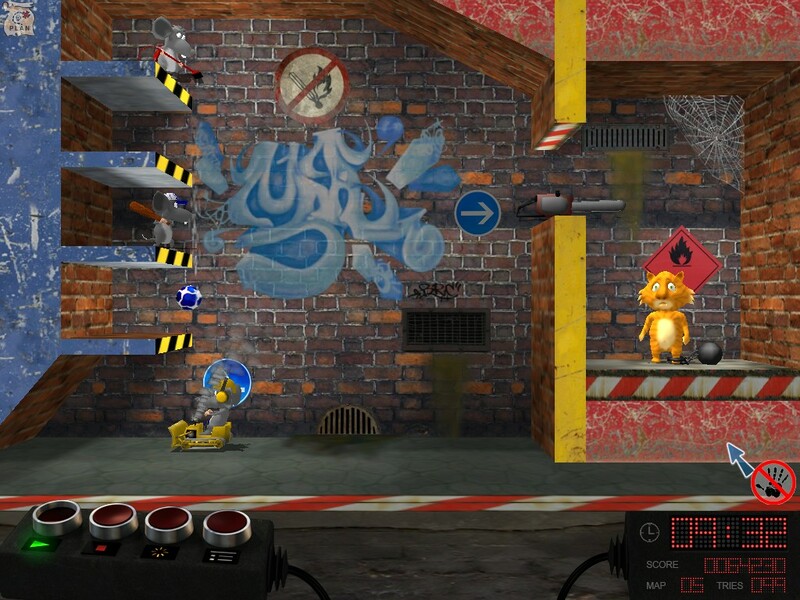 In terms of gameplay, Bad Rats does an admirable job of emulating the late and great Incredible Machine. The presentation is what gets me, because it's so very unattractive. The art style is simply not very good by default, and gets exponentially worse with the cartoon violence. The gore is excessive and not all that humorous, and the deaths can be more disturbing than wacky. Melting a cat in a microwave? That's awful. Maybe it's just me, but it's worse because the chained up cats look depressed and resigned to their increasingly complex fates. Are their faces supposed to haunt me? Because consider me haunted. Also, and this is another example of "wacky" gone wrong, the suicide bomber rats dressed in turbans and beards is pretty racist. Just saying. I just can't figure out what Invent4 was aiming for with this game. It's simply not engaging or mature enough for adults, but the gameplay would be perfect for kids. But the thought of giving this game to anyone under 18 is sickening due to the gore, violence and wildly inappropriate humour. In conclusion, the best way I can describe my experience with Bad Rats is with one word: uncomfortable. Make of that what you will. So far so good, as it seems like we're keeping an even keel between the fantastic and the not so much. but what shall the third tier of Indie Gala goodies bring us? And what about that bonus music? Find out next time: same website, same bundle. 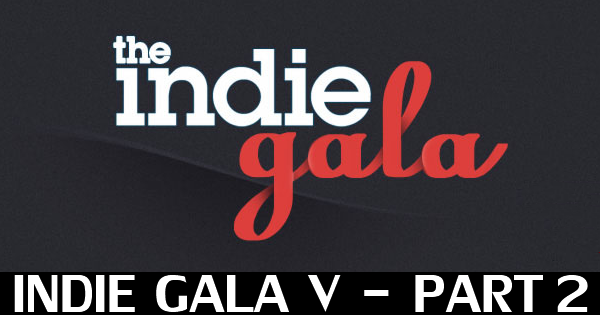 Click here to read part three of the Indie Gala review.